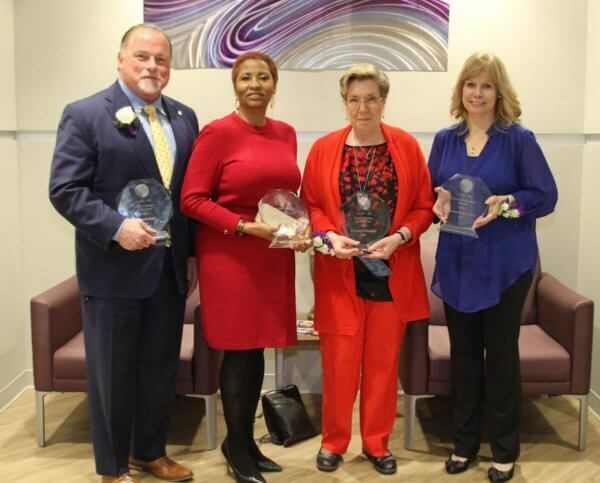 Baton Rouge, LA – Pat Mitchell, CEO of The Carpenter Health Network, was honored March 7, 2018 by the Baton Rouge Region of the National Association of Social Workers, Louisiana Chapter as 2018 Public Citizen of the Year. The annual award recognizes an outstanding member of the Greater Baton Rouge community who is not a social worker but has made significant contributions to an area or population of concern to the social work profession such as vulnerable populations; quality of life in communities; and social issues, and whose accomplishments exemplify the mission and values of professional social work. “Pat Mitchell exemplifies social work values and principals while fulfilling his passion and mission to best serve others,” said Shelly Weaver, LCSW. “He has truly made a measureable, positive difference in countless lives” she wrote in a letter nominating Mitchell. Edgar Guedry, LCSW noted some of the contributions that Pat has made, including funding a woman’s center in the Baton Rouge area, contributions to local churches and schools, and supporting several disadvantaged children by providing tuition for school. Guedry also highlighted Mitchell’s support of the profession by noting his employment of social workers in key leadership positions throughout his healthcare network as well as utilization of their skills in all of his entities. Mitchell, pictured with Social Worker Award Recipients (L-R): Mary Scott, LCSW-Lifetime Achievement, Carmen Weisner, LCSW-Social Worker of the Year, & Elizabeth Franklin, LCSW-BACS-Dorothy Schenthal Leadership Award, stated he was humbled and honored to recognized by social workers, a profession which he tremendously admires for their commitment to effect change in their environment. He gave tribute to his wife, son, daughter, and son-in-law who attended the ceremony. His daughter stated she also became a social worker due to her father’s influence. Based in Baton Rouge, Louisiana, The Carpenter Health Network serves five southeastern states, providing a continuum of care that meets patients’ changing needs over time through nursing, rehabilitation, home health, medical house calls, hospice and more. For more information, call 225-769-4674 or visit TheCarpenterHealthNetwork.com.